I always try to make my Sundays all about awesome food. I always make a big deal about Sunday supper. It has to be something special. It needs to be mindblowing. I also like to prepare some sort of brunch for us. Yesterday was a success and I achieved pretty much everything that I wanted to. 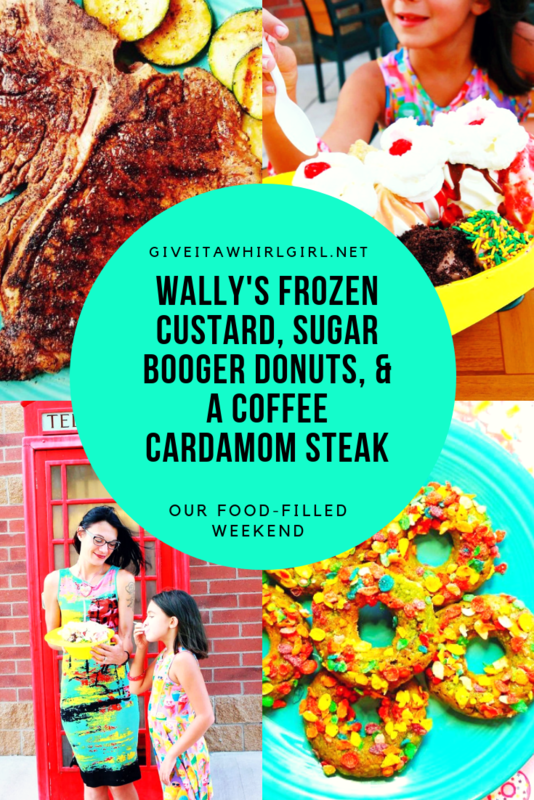 We had homemade baked donuts in the morning, tender & juicy t-bone steaks for dinner and an ice-cream sundae at Wally’s Frozen Custard large enough to feed an elephant! Keep reading to find out more about this ice-cream shop in my Wally’s Frozen Custard review! The morning kicked off with what I am calling, “Sugar Booger Donuts”. Natural food coloring is weird. Green often achieves its color with spirulina, which is a superfood blue-green algae substance. Did you know that Fruity Pebbles are gluten-free? They sure are so these donuts were gluten-free for the win! Here is the part that killed them for me though, for this recipe I tried out Stevia to sweeten them. Usually, in my baking, I stick with raw money or pure maple syrup, or if I have to I will use coconut sugar. The Stevia was a big turn-off to me with the final product. While edible, they just were not as delicious as the other natural sweeteners that I use. For fun, I made a glaze for the donuts and topped them with Fruity Pebbles, which is a cereal that I avoid having in my pantry. I bought a little individual serving size tub for a dollar at Kroger just for the sake of using them as donut topping. My daughter was in shock to see Fruity Pebbles in the house. Sugary, processed cereals are a big no over here. I had mixed feelings about using them as a topping too. They are like eating pure sugar. Way too sweet for me. I still do want to try a Lucky Charms topped donut someday. I might enjoy that more since that was my favorite cereal while I was a little girl. Sounds like I am hating on my donuts here. I kinda sorta am. I am definitely going to whip up some coconut flour vanilla donuts again but totally steer clear of the Stevia. I can usually tolerate Stevia in my Zevia soda but it just didn’t agree with me in baking. Nothing special happened for lunch over here. We just snacked on some fruits. By the time 4 o’clock rolled around my tummy was growling and hangry! It might have been growling so loudly because it knew that I had t-bone steaks in the fridge. I took the steaks out and prepared a rub for them. I really wanted to try out something new with my steaks. For the spice rub I used a recipe from Do You Even Paleo. This paleo rub was superb and I would not change a single thing about it! It uses ground coffee, cardamom, coconut sugar, paprika, garlic powder, ground ginger, and salt & pepper. I picked up a bag of baby rainbow carrots at Nino Salvaggio’s a couple days ago and I prepared them with a cardamom ghee (clarified butter). I love roasted carrots with a raw honey drizzle on them but I also wanted to try something new with the carrots. Really wanted to go for some brand new flavors last night. After I had the rub on the steaks for awhile I heated up some ghee on my cast iron grill pan. I threw them on and heard that lovely sizzle! I cooked them medium rare, which in my humble opinion, is the only way to eat a steak. Steak needs to have that pink center. I took the steaks off the pan after I grilled each side for a few minutes and then let them rest for a few minutes. I will tell you this… these steaks came out absolutely perfect! Everything about this steak was spot on. They were so tender and juicy and the flavor from the rub was extraordinary. I loved these steaks so much I am pretty sure we will be eating them the same way again tomorrow. Kroger had value packs of t-bone steaks on sale so we ended up getting four biggies for a great price. Chloe and I were supposed to bake a layer cake yesterday but it never happened. I have Amazon Prime and unfortunately, an extract that I had ordered did not arrive when promised. So our cake is put on hold until that extract shows up. Me and Joe took a trip to Wally’s Frozen Custard one weekend while Chloe was away at her grandparent’s home. We ordered the gargantuan 911 sundae. No way we could finish it all but I wanted to visit this place with my daughter so she could witness this huge sundae. Wally’s Frozen Custard is located in St Clair Shores, MI and it is one of the most happening spots to grab a frozen treat! It has a very unique look and it appears to be like a fire station. They have plenty of tables outdoors so you can enjoy your frozen custard and enjoy the beautiful weather. They have a fantastic menu to choose from and offer something for everyone. And get this~ you can even order BREAKFAST at Wally’s Frozen Custard. For breakfast, a few things you can choose from are oatmeal, bagels, and muffins. The 911 sundae is a steal at $9.11 at Wally’s Frozen Custard and is the most perfect sweet treat for sharing. There is definitely enough to go around for a family. It includes 9 dollops of frozen custard, 9 different toppings (the hard shell is hands down my favorite topping), whipped cream & maraschino cherry. If you would love to give Wally’s Frozen Custard a whirl you can find some money-saving coupons on their website. Just click HERE. Hope you all had an enjoyable weekend full of good eats and tasty treats. Weekends for me are a time to splurge and indulge in whatever my heart desires. I eat healthy all week long and the weekend is a time for me to cut loose a bit. Question Time! Did you eat anything marvelous over the weekend? I am so curious so please leave me a comment and tell me about it! Find out more about Wally’s Frozen Custard in St. Clair Shores! Disclaimer: This post contains Amazon affiliate links. I do receive a small commission if items are purchased through those links. Proceeds help make this blog a better blog experience for my readers. This entry was posted in Local Spots I Visited, My Cooking Journey and tagged baking, breakfast, cardamom, carrots, coffee, donuts, frozen custard, fruity pebbles, ghee, gluten free, ice cream, paleo, purple carrot, steak, steak rub, tbone steak, Wally's Frozen Custard. Bookmark the permalink.